For my birthday in November, Chris signed me up for a fabric screen printing course at the Fremantle Arts Centre. This was one of those thoughtful presents that I never would have consider to do for myself, but loved so very very much. I think that makes the best kind of present don’t you think? I enjoyed it so much that I immediately signed myself for another art class when it finished. 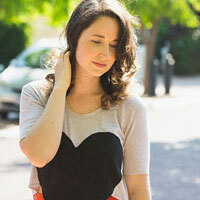 I found it to be so relaxing and inspiring to tackle a craft different to sewing. You all know how deeply i love sewing, but it is hard sometimes working in a field that is also your hobby. It was refreshing to throw some creative energy into a craft that was different than what i usually do but still somewhat adjacent to sewing. And coming away with a piece of fabric that i could sew and use was just the most amazing feeling! During the course i took a few photos with my iphone so thought i would share a little info about the course i did and the process of screen printing a repeat incase you are interested! This was quite an intense course that ran over four weeks, and truth be told, I think it could have been a bit longer. I think we all spent a lot of time feeling quite overwhelmed because we were learning so much at such a fast pace. Having said that, I had an amazing time, so maybe the fast pace was part of it haha. It was taught by Angela Ferolla, who is absolutely lovely and has a real wealth of knowledge. The class size was small, which i think was really ideal. With only 4 of us I felt like we got a lot of personal help, and since you need a lot of room for screen printing, i’m not sure more of us would have fitted our work on the table! 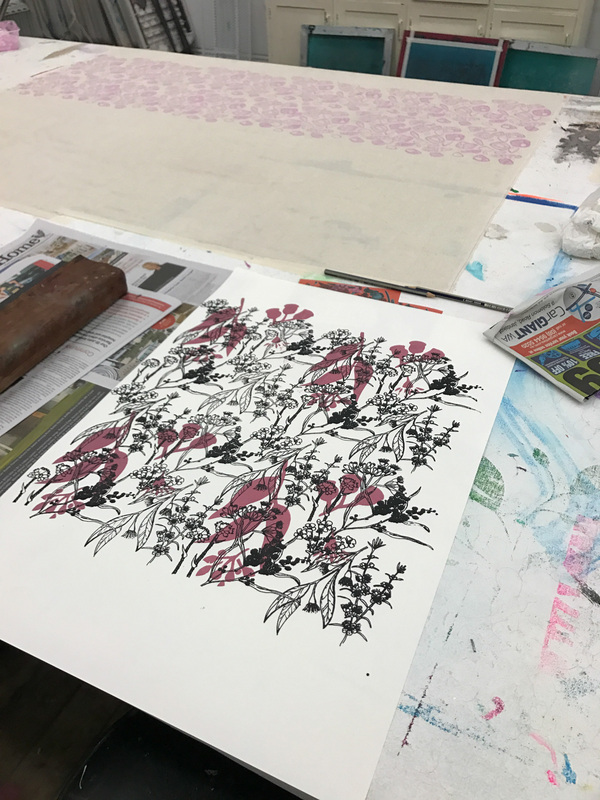 Since this course was about creating repeat prints for fabric, we spent most of our time working on how to create good repeating designs, and how to physically screenprint a repeating pattern seamlessly, which i found really nerve wracking and fun at the same time! 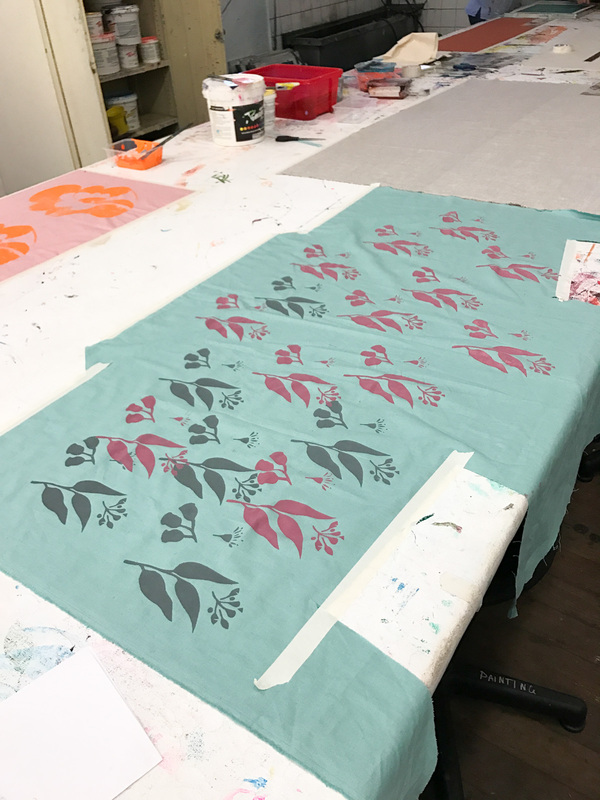 I think if you’re looking for more of a beginner guide to screen printing this isn’t really the class for that- it was definitely more focused on creating repeating fabric prints. Which obviously really appeals to me because i wanted to sew with what i made. We obviously did cover all the screen printing basics, but i feel like you could almost take an entirely separate course on just the screen printing technique. I truly enjoyed this course, and think it was one of the most wonderful creative experiences but there are a few things I wish had been a bit different. I think one of the things I found hardest in this course was the lack of structure, and the fact that digital methods of creating repeats weren’t really explored. I think this is more of an expectation mismatch though. There really isn’t any time in a 4 week course to add in digital methods, i think that is something i need to research separately. 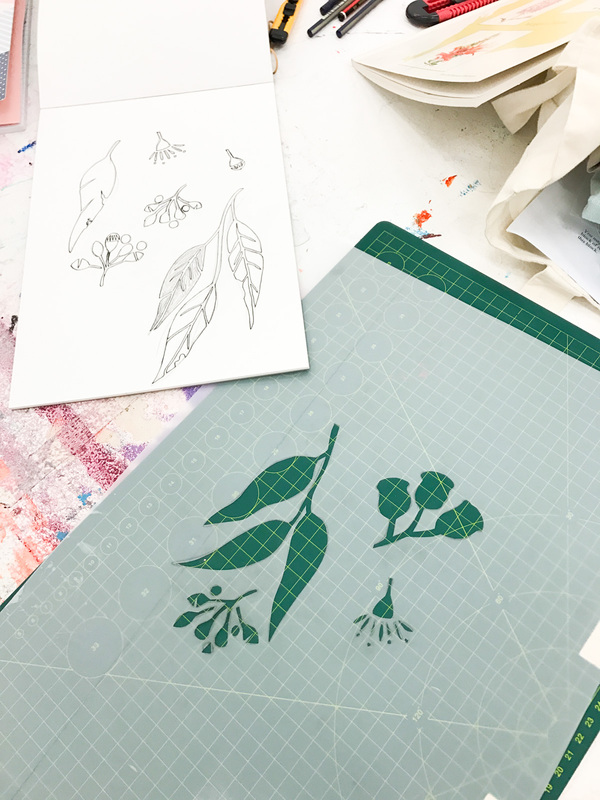 There was a lot of hands on instruction on how to create repeats through photocopying and tracing etc, and I feel like learning this in a hands on method is really valuable and necessary. Angela left the kind of design you explored very much up to you, which i really enjoyed. Having a lot of freedom and course homework was wonderful because it really encouraged me to spend a lot of time fleshing out my design at home as well as in class. 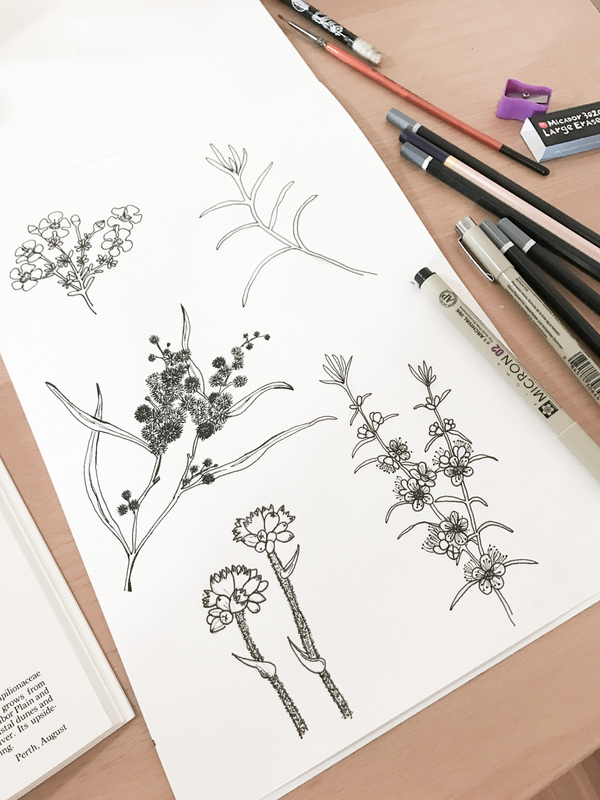 I came with a set idea of creating a print based around Western Australian wildflowers and I really appreciated having the freedom to do that. 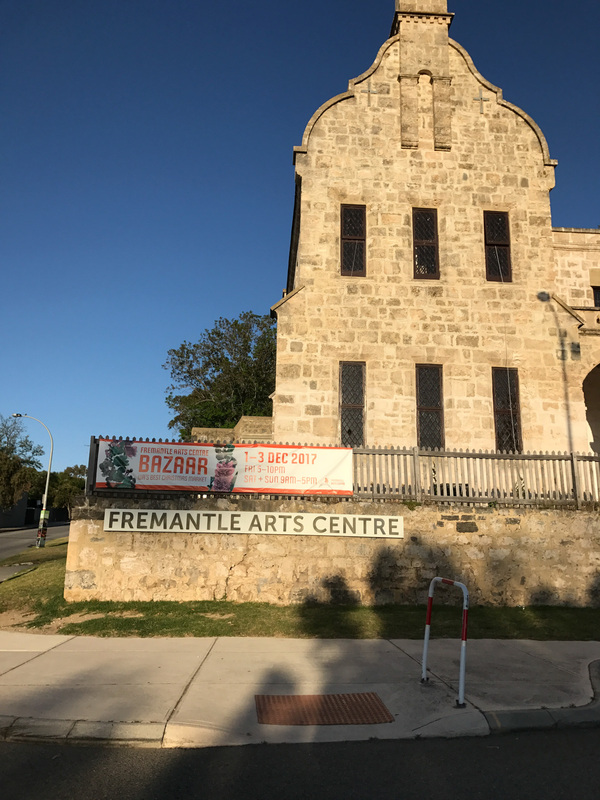 Doing night classes at Freo Arts Centre was also just a really lovely experience in general. The building is gorgeous, and there are other classes running at the same time, so they set out a little tea and biscuit station for night students, and i felt like that was a really sweet touch. If you live in Perth or Freo and are interested in taking this course, there is a new one starting up on Feb 20th 2018. (1) Look for inspirational images and sketch them out. 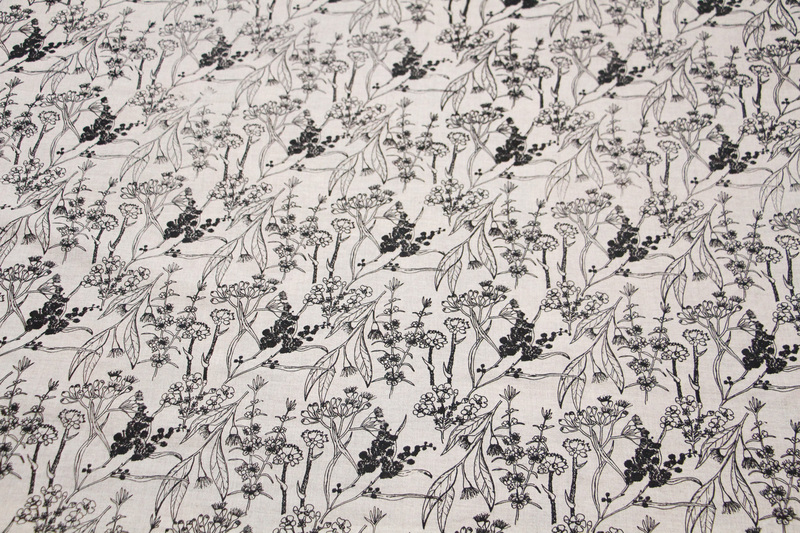 I am always inspired by Australian flowers, but can never find fabric prints with Aussie flowers that i really love. So that was my goal. I used some flowers from my own garden as well as a book on Western Australian flowers that my mother in law gave me a few years ago. I like to sketch with pencil, then go over my drawings with Micron pen then rub out the pencil. A lot of people traced designs, which is fine, but copying things just makes my eye twitch, so when drawing from a book I decided to draw my own freehand interpretation of what was there. We also experimented with painting motifs with ink, but i found i wasn’t feeling inspired by that, and kept coming back to oversimplified ink paintings which just didn’t make me excited. So pen it was! (2) Begin creating a motif with your images. Creating a motif could mean using one image and really finessing it or putting all your images together to create a design. This was the really fun part! 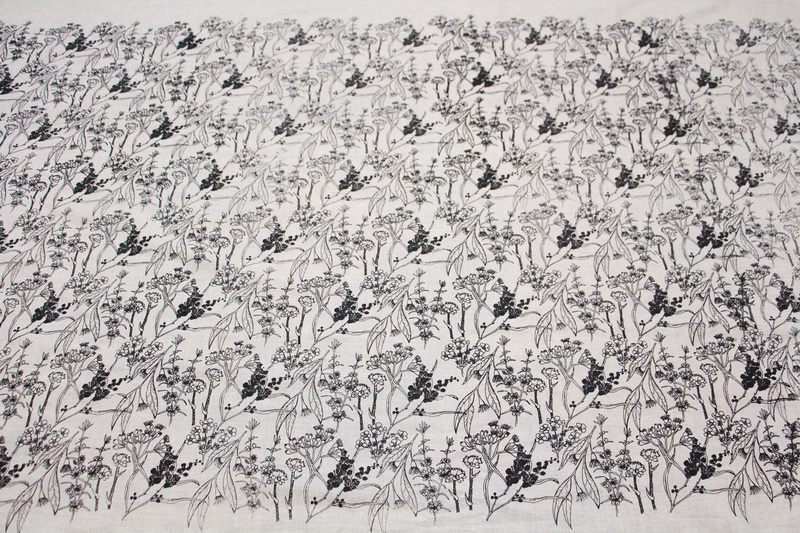 I decided that I wanted quite a dense print, with multiple florals where all the florals overlapped each other, instead of a single design that was repeated over and over. Or individual motifs that were spread out. 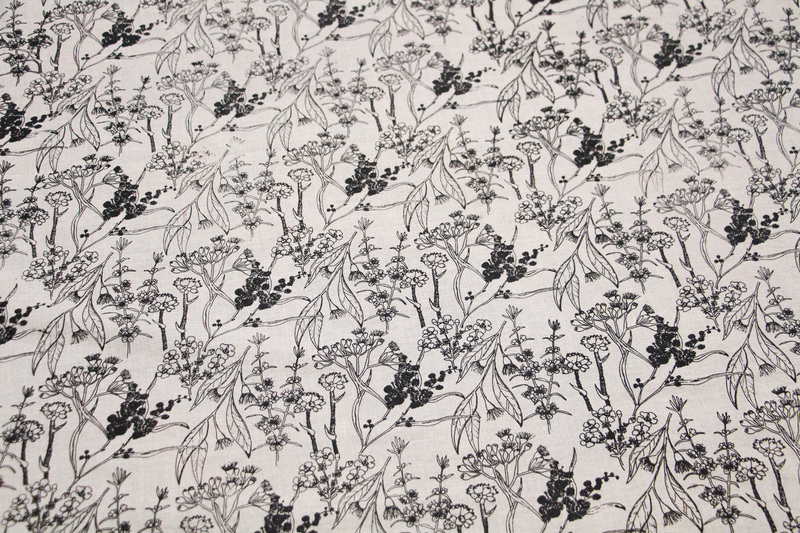 I feel like for garment fabric that made the most sense to me. Angela gave us lot of examples of how to tile designs, and walked us through a lot of methods for how to seamlessly repeat patterns. Most people used a method of photocopying their designs over and over, cutting out and rearranging them then taping back together to create a repeating design. 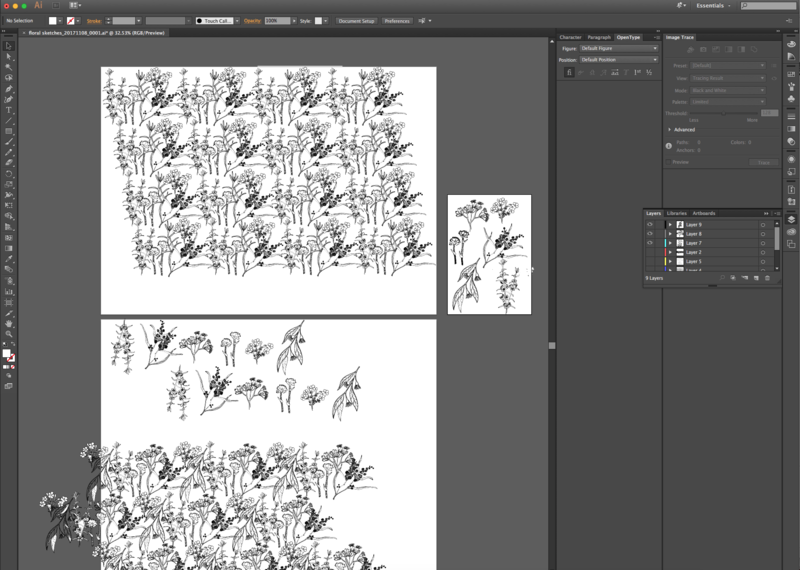 Since i work in Adobe Illustrator allllll the time creating instruction diagrams for my patterns, i was very comfortable with using that program. So I scanned my individual florals into the computer, vectorized them, and spent a lot of time rearranging them and coming up with a dense repeat in Illustrator. I’m really happy with this method. I feel like it worked better for how detailed my drawings were, it was faster and i like that if i want to i could upload this design to Next State or Spoonflower and digitally print some more fabric. For those who used the method of photocopying and tracing designs over and over, this stage required going over the design with black marker to make sure everything was a solid black line. Then getting it photocopied onto acetate. Since my design was digital i just took a usb to the print shop and had them print it out. I tried to work my design so that it would fit neatly into one A3 sheet of acetate so that it would be easily fit on my screen. Then i had two sheets printed, and overlapped them so they would fill up the screen but leave enough room at the top and bottom for ink. This part was really cool! The way your screen is burnt is to cover the screen in photo emulsion liquid. Which honestly was the most terrifying part of the experience for me. I was shocked how hard it was to neatly and evenly apply this emulsion. I thought it would be the case of just painting on, but nope. It involved pulling a special tray over the screen at a particular rate and angle. Thank goodness Angela was at our elbow helping with this the whole way. The screen then needs to dry. So the next week when we came back we could burn them. To burn the screens they are placed in a light box with the acetate on the front for a few minutes (you can also use the sun!) and everything that is see through is burned onto the screen, and everywhere that was black the emulsion doesn’t set, and as a result can be washed out leaving your design. It’s really cool. So after that we rinsed out our screens, and the emulsion washed away in all the sections where our black designs had been. This is why it’s so important to make everything solid black! And after all that work, we could screen print. I’m not sure if it’s obvious from the photo below, but we taped our fabric to the table with masking tape to keep it taught. Then we measured the width of our design, and made pencil marks on the tape so that we could line up our screen with those marks and overlap our design properly. Below is my first line of printing! In order to print the next row of design the bottom row needs to be dry. The reason for this is that you run a piece of tape along the design you just printed, then make your pencil marks all over again to help you line up your screen. You obviously can’t tape over wet ink, so i spent a lot of time with a hair dryer frantically trying to dry my print! If we had more time and fabric we could also have printed a checkerboard pattern, then waited to dry, then printed in the all the gaps. And after printing as many rows as we could before class ended our fabric was done! I heat set mine once i got home, by ironing it for a few minutes until all the ink was set. I really wish i had had time to heat set in class because they had a Elna press and that would have been wayyyy faster for pressing an all over design! One of things i really appreciated was that Angela squished as much as she could into 4 short weeks. 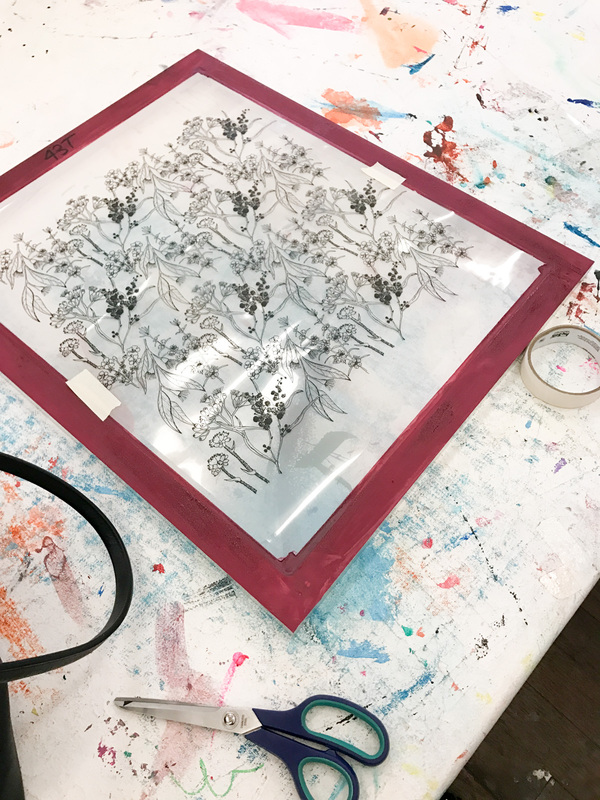 Since we had all worked hard to create our burnt designs, she also showed us another faster method for screen printing designs that is a little easier to replicate at home. This method simply involves tracing your design on drafting paper and cutting out your design with an exacto knife. the difference with this method is that you have to be careful with how you draw your design as you need to make sure your design is always connected to the drafting paper or else pieces will fall out. It also needs to be easy to cut. Circles were hard. 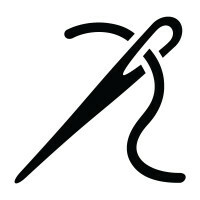 For this reason i think that burning a screen is better for detailed designs, where as this cutting out method is better for simplified designs. 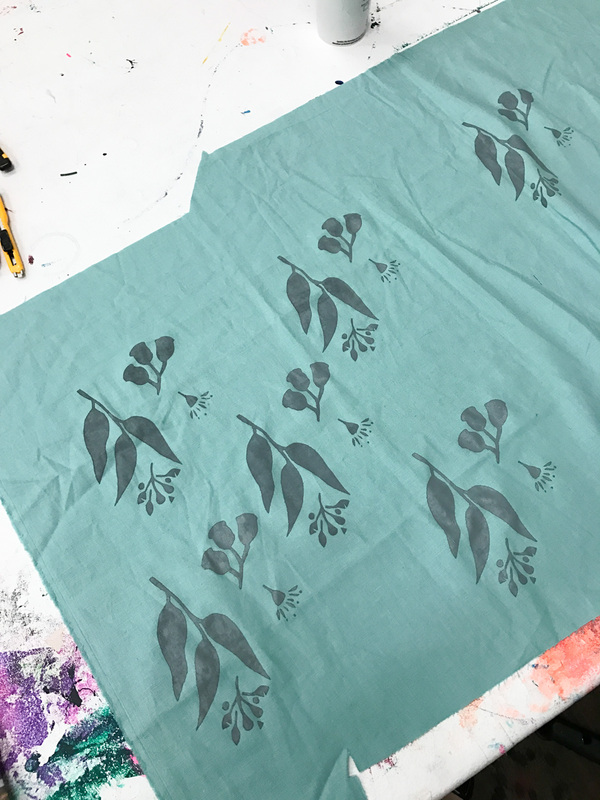 I made a few random gum tree motifs, and after cutting them out i printed them in an imperfect repeat on some scrap linen i had brought with. To use this stencil you simply tape it to an empty screen and then you can print right away. Nice and fast! When it was dry i printed in pink over the top again, and i really like how that turned out! And since i had a little time at the end of class i also printed all of my motifs on a bunch of different sized cardstock. I’m really glad i did this as we cut all those prints into greeting card size pieces and they have become my go to for writing nice cards to anyone. I really love they have a personal touch, i think i’ll need to print some more. 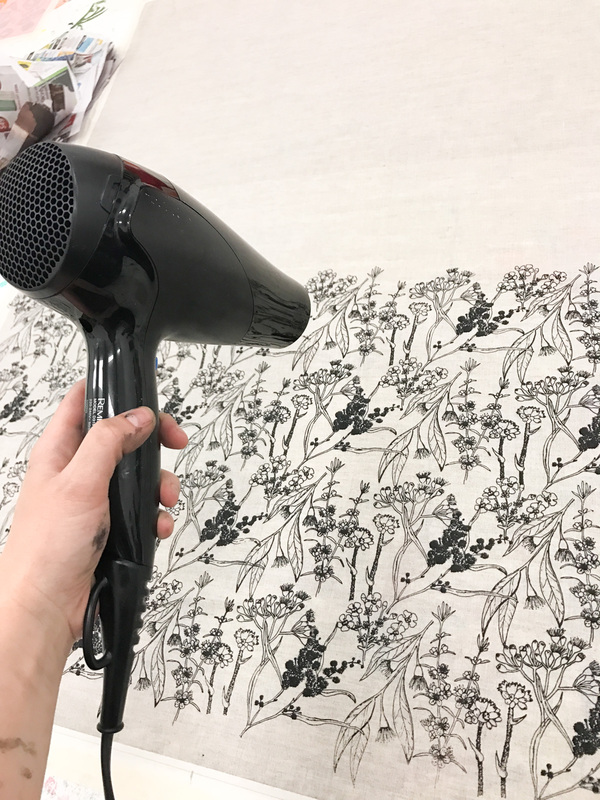 I ended up printing a 1m length of 150cm wide linen from The Fabric Store for my main print, and then spent a lot of time thinking about how to squeeze the most i could out of it. What i decided on was making a Eucalypt tank that i can wear and some throw cushions for our couch. I’ve already sewn the tank so i’ll need to post that soon (i love it!!) and still need to sew up the cushions. For the green linen that i printed with the cut out stencil, i realised after that i had accidentally used the exact same colours as Bunny’s bedroom theme, so i’m going to surprise her with a throw cushion for her bed! I think she will love it because that kid is throw cushion crazy! Screen printing is honestly incredibly addictive, and now I find myself dreaming of printing more and more things. I wonder if Chris will be ok with me turning our outside dining table into a screen printing station hehehe. 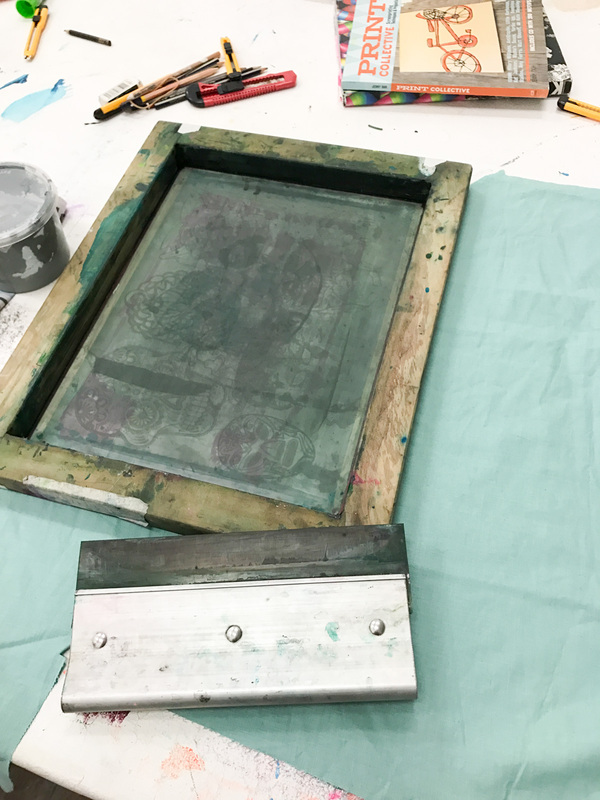 I really hope you enjoyed hearing a little bit about my screen printing classes. 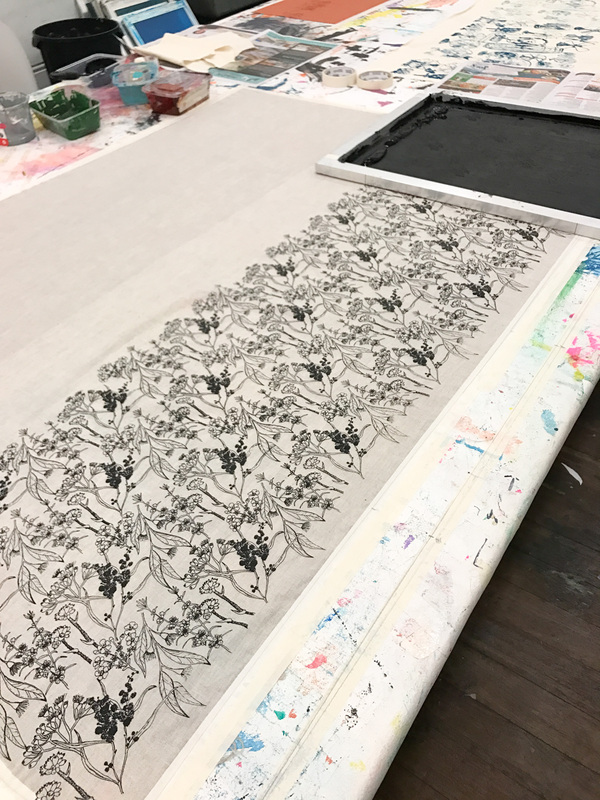 Have you tried your hand at screen printing? I honestly can’t wait to try it again! 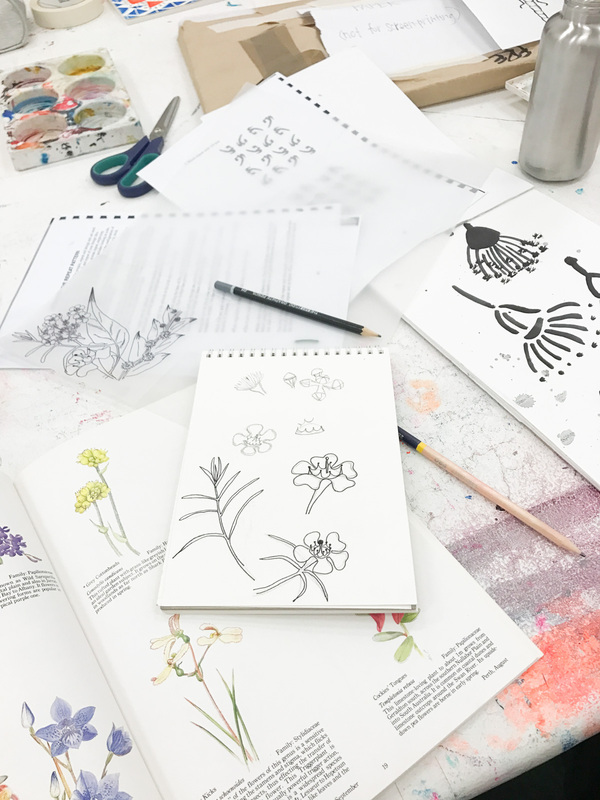 Love your wildflower drawings and fabric. I can’t wait to see your Eucalypt! This was really interesting to read. 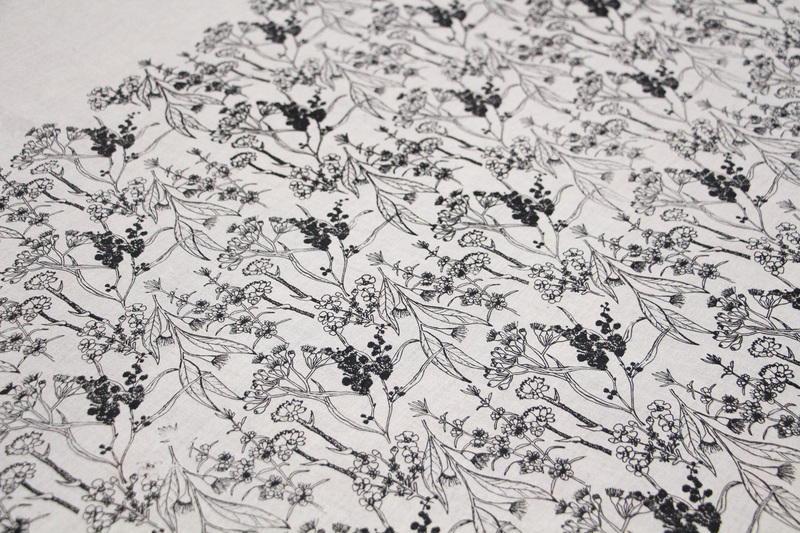 It has given me a greater appreciation for the effort involved in hand printed fabrics. Honestly, me too. 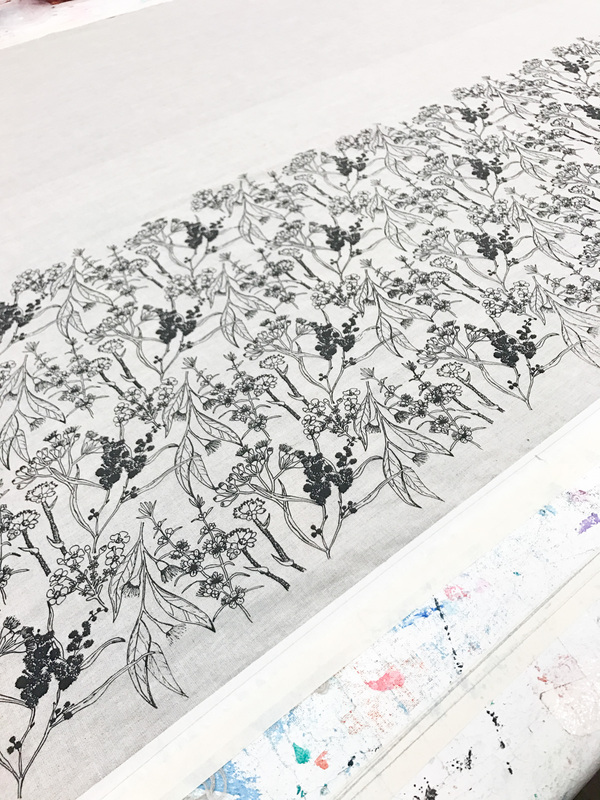 Before trying it myself i had no idea how much work goes into hand printed fabrics, and now I keep thinking about block printed fabrics and how labour intensive that process must be!